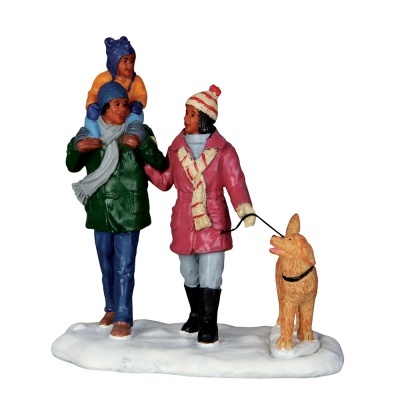 Lemax Winter Walk Figurines depicts a family taking a wonderful stroll in the Winter snow with the family dog on a lead and the child on his Fathers shoulders. A relative newcomer to the delightful Lemax Village themed range, this figurine piece joined the Lemax collection in 2016. Comprises multiple delightful individual hand painted polyresin figures on a single individual snowed base to compliment your seasonal Lemax Village Christmas display.